We ran a long overnighter for the Ocean City, NJ Overnight Tournament. We started back in the SW corner of the Lindy and had a white up on the teaser right away that didn’t switch. BUMMER! The rest of the day was soooo awfully slow. We dropped for tilefish for a bit just to break up the day, then we worked up into the Carteret, into the deep, back to the edge, then ran up to the Carteret again to try and snag a tuna at dark with no success. We drifted all night for swordfish and not a touch allll night. We worked our was inshore looking for a qualifying dolphin, wahoo, and tuna. We managed to pick at some dolphin and caught 2 qualifiers which for now have us in the money. 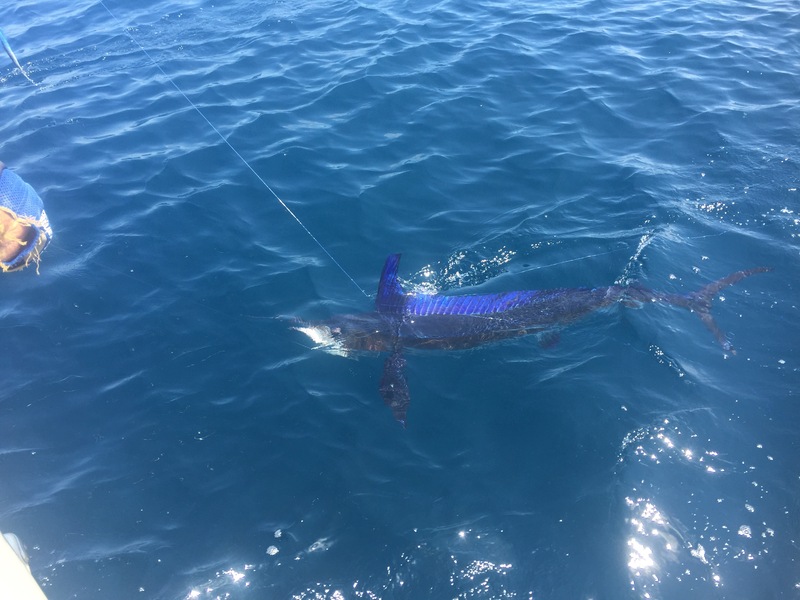 We got smoked on the down rid and we thought for sure we had out wahoo on but it turned out to be a 4′ mako which we released. 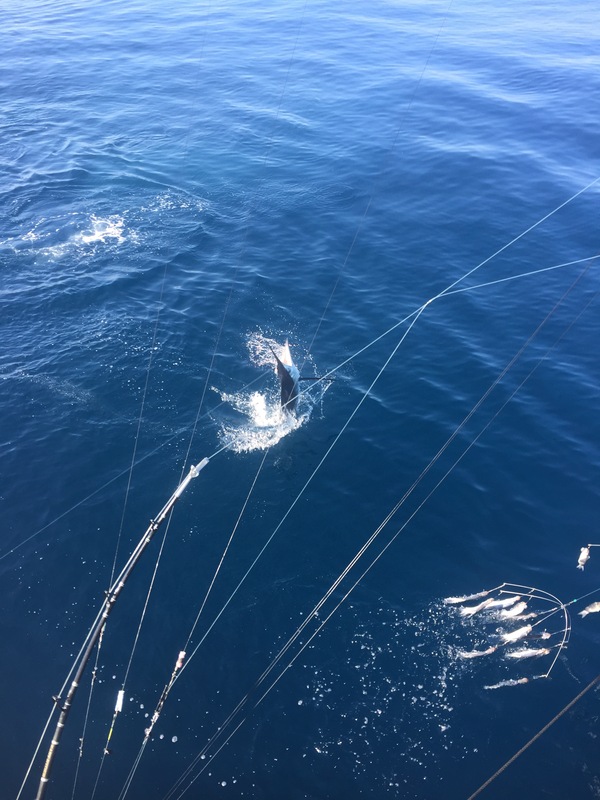 We saw a blue marlin tailing on the surface that never ate and that was it. VERY tough trip! Not what we had hoped for at all. Due to A LOT of rain an thunderstorms throughout the area Saturday we postponed to Sunday. We went out in search of marlin and whatever else would decide to bite. We started fishing in the Spencer Canyon and we had a lot of life, pilot whales everywhere, plenty of birds, and great bait marks, BUT no fish. We worked the area hard but never could get a bite so we worked up to the Lidenkohl Canyon. Once we got into the SW corner we found a barrel floating that held a few mahi that we picked up. Then shortly after we hooked into a white marlin on the left long. 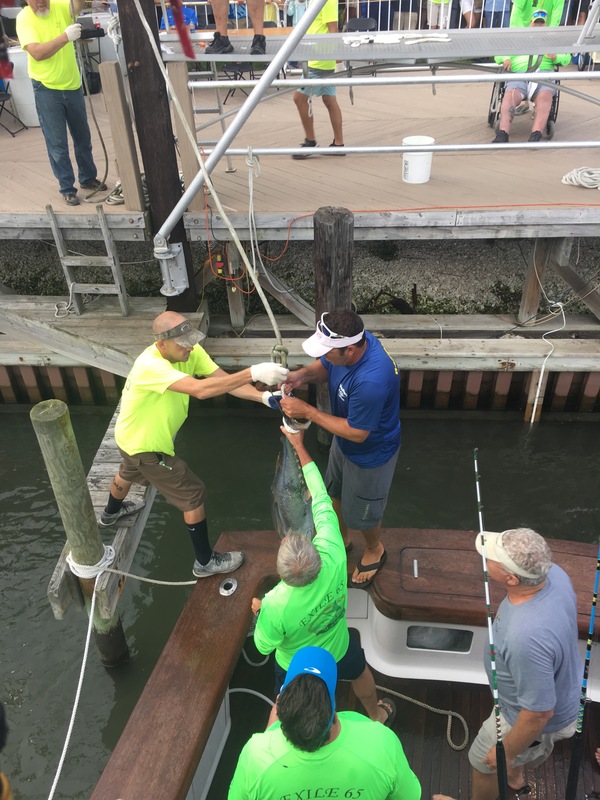 Mary was on for her first white marlin! After a few jumps and a solid fight, Mary did awesome at getting the fish boatside for a clean release. We worked the canyon some more without much luck and decided to end the day catching some tilefish. As we were picking up we had a white pile on the right flat line and we got a quick release on the white. Nice bonus fish, haha! 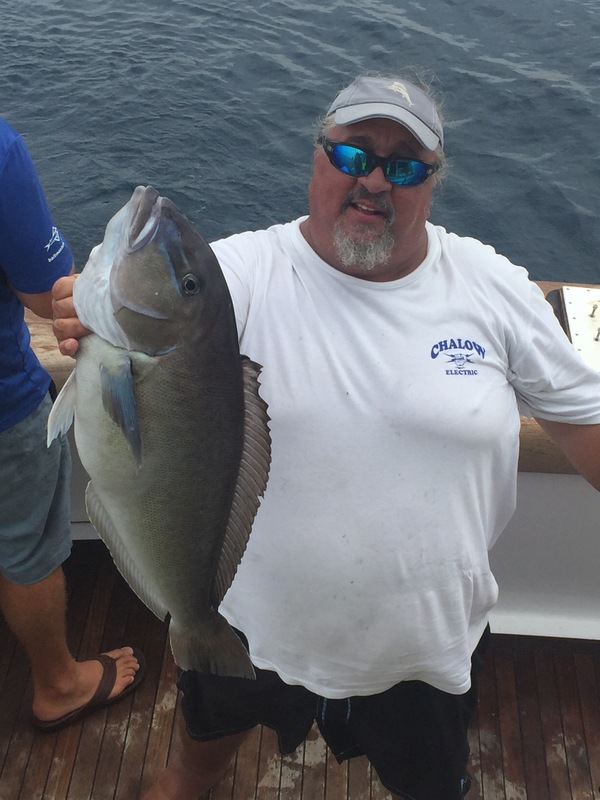 We dropped for blue line tilefish for an hour to add some meat to the box and called it a day. 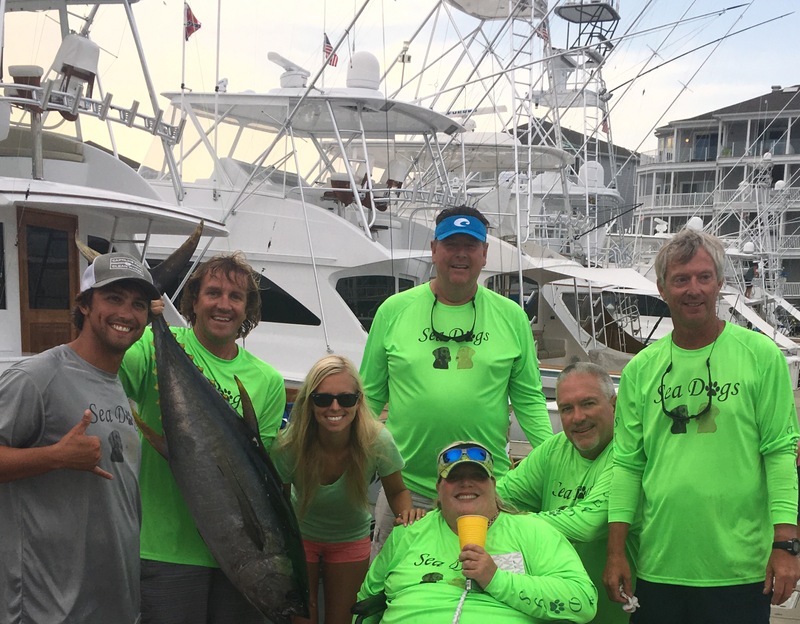 Well we didn’t get anything quite big enough to take to the scales but we ended the White Marlin Open with a solid final day of fishing releasing three white marlin and a spearfish. Joe and I wanted to thank our WMO crew of Bob, Nick, Keith, Stephen, William, Pete, and Phillip for fishing with us. We can’t wait to do it again! Keith did get three of the whites today so we are curious to see where he lands in the angler category as well as where Exile 65 ends up with the release category. Tough fishing this tournament but we managed to get some everyday and had a lot of fun doing it! Day 2 for us found us starting on a 1 degree break in the spencer canyon. 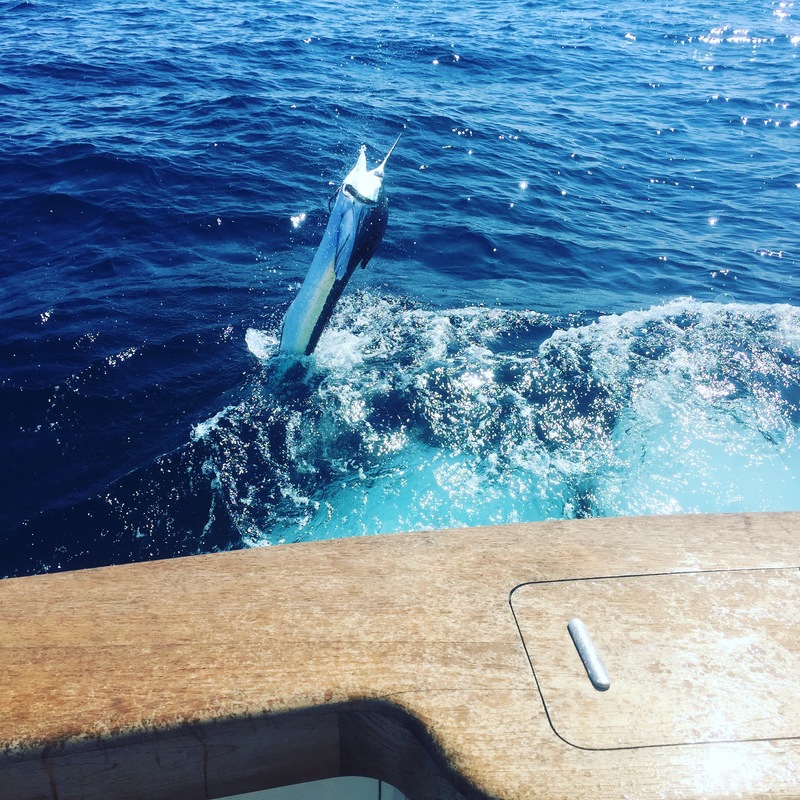 We had a white marlin up on the teaser early but it never switched. We worked the area for awhile and slid south with no action. It was pretty slow everywhere so we made the move to the Lindy to try a different area and hit the reset button. Here we ended up grabbing 1/2 Sailfish and a white marlin to end the day. Overall slow day of fishing. Our first day of the WMO aboard Exile 65 started off with acres of two tone dolphins everywhere! 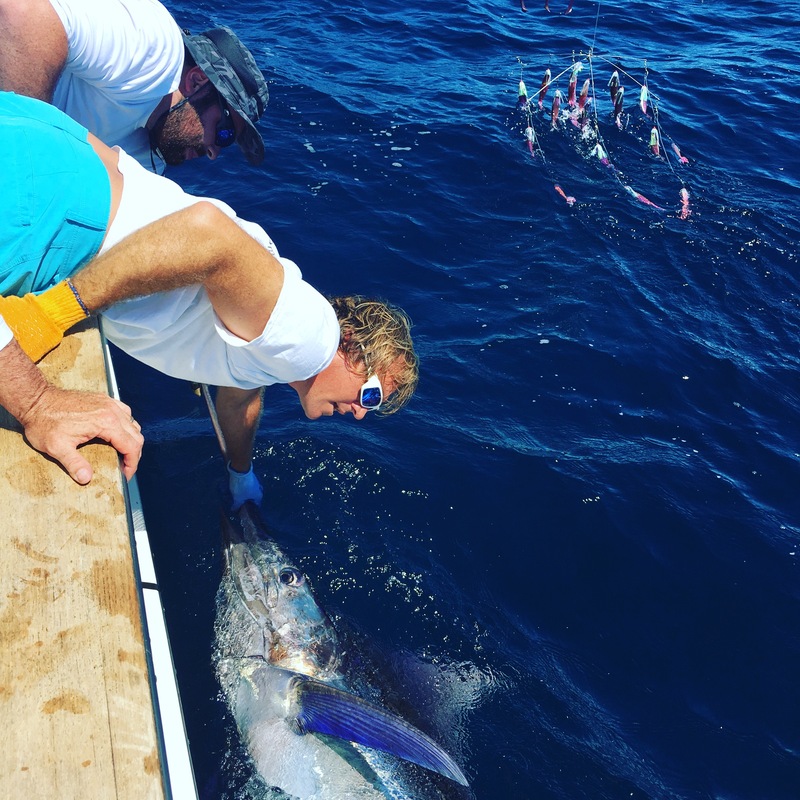 We were fishing in the NE Corner of the Wilmington Canyon and we didn’t see our first bite until 1030 on the left long ballyhoo with a blue party hat. Keith fought the fish for awhile and it didn’t look like a bad fish so we measured it boatside and the white measured an inch shy of the minimum so we let em go. The remainder of the day was rather slow and we made our way to the SW corner of the Wilmington canyon when a decent sized blue came in on the left teaser (pink squid chain with a blue and white express chaser). After an awesome switch by Joe to the 80W pig pitch Keith was on for a heck of a fight. The blue never jumped and gave Joe a shot at the leader quite a few times and stayed down hard until finally we got the fish boatside to measure. She was 108″, 6″ shy of the minimum. Awesome fish! Made the day.